these sunglasses on and audio record everything they say! You will not miss one word of audio evidence with these on! Think about walking up to anyone outside or inside with these sunglasses on and being in a position to audio record everything they say! 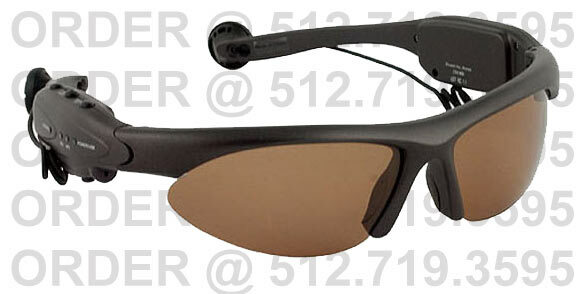 These are the all new MP3 covert voice recorder sun glasses with built in microphone and stereo ear phones. Stylish and functional they pack 256MB of built in memory which will allow up to 18 hours of voice recording and 8 hours of music play back in WMA and MP3 format. Using the USB connection, attach the sun glasses to your PC for file playback and file transfer. Simple to use and easy to operate the Voice Recorder Sunglasses are a must have for your evidence gathing collection bad of tricks. As a bonus, they also double as an MP3 player so you can use them for yout audio evidence-gathing "business" needs and for "pleasure!" Agencies With Very Good Price Breaks In Lots of 3, 5, 10, 15, 20 , 25 And More.